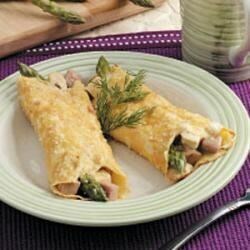 "With a saucy ham and asparagus filling, these savory crepes make a lovely dinner. They're a wonderful change of pace from everyday fare." For crepe batter, beat eggs and milk in a small mixing bowl. Combine flour and sugar; add to egg mixture and mix well. Cover and refrigerate for 1 hour. Heat a lightly greased 8-in. nonstick skillet; pour 3 tablespoons batter into the center of skillet. Lift and tilt pan to evenly coat bottom. Cook until top appears dry; turn and cook 15-20 seconds longer. Remove to a wire rack. Repeat with remaining batter, greasing skillet as needed. When cool, stack crepes with waxed paper between. In a small bowl, combine the soup, Worcestershire sauce and nutmeg. Set aside 1/4 cup. Add the chicken, asparagus and ham to remaining soup mixture. Spoon 2 tablespoonfuls over each crepe; roll up tightly. Place seam side down in a greased 9-in. square baking pan. Spoon reserved soup mixture over crepes. Sprinkle with 1/4 cup Parmesan cheese. Cover and bake at 375 degrees F for 20-25 minutes. Gradually fold cream into mayonnaise. Spread over crepes. Sprinkle with remaining Parmesan. Broil 6 in. from the heat for 3-5 minutes or until bubbly and golden brown. This wasn't great - very rich and tasted like the canned soup. Thanks though. For the love of all that is holy. The wife and kids devoured the entire pan while i was at work. Glad i made myself a small pan for the next night. It was crazy awsome delicious. wonderful.........think about doing it with shrimp, green onion and cream of shrimp soup!!! Husband loved it.